Although different training methods can produce similar results, a rider must know what to do, how to do it, and, perhaps most important, why he/she is doing it. The fundamentals are explained in Book One and should be mastered for the simple reason that what a horse has learned in the early stages of his education will remain with him for his entire life. Later, should a training problem occur, one can always revisit these fundamentals, review, improve, and perfect them. This work study explains how to Divide and Conquer the horse’s body parts. To be able to properly perform the exercises, the horse should be able to find the appropriate head position independent of the rider. If these exercises, alone, do not result in the horse being able to find the appropriate head and body position, I explain the prerequisites to correctly set the horse’s head: cession (yielding) of the mouth and the flexion of the poll. François Lemaire de Ruffieu grew up in France. He was first trained by Master Jean Couillaud and graduated in 1967 from the Cadre Noir, one of the oldest and most prestigious riding academies in Europe. During his 6 years in the cavalry at Saumur and Fontainebleau, he studied and showed extensively in dressage, stadium jumping, three day eventing and steeplechase. He taught riding in Paris at the Military School of War. Since 1978, he has given clinic throughout United States of America and Europe. His students have won year-end high-score awards in equitation, hunter classes, stadium jumping, dressage, and combined training. Since 1988, he has been a panel member of the American Riding Instructor Certification Program and in 1996 he was awarded the title of Master Instructor. He currently lives in Florida. How does the rider obtain a good seat? Where should the rider sit in the saddle? Calm, Forward and Straight must always serve as a guideline during the training and the order should not be interchanged. On this subject, all Riding Schools worldwide agree. These schools diverge only in their style due to the culture of their own country. In these volumes, I recapture and explain the foundations provided by the great Masters. I have provided appropriate exercises to recreate, develop, and enhance the horse’s natural gaits that should be the common denominator of all riding styles and training disciplines, including Dressage, Jumpers, Hunters, Western, Pleasure, and many others. Book One includes the training progression from the beginning of the elementary level. 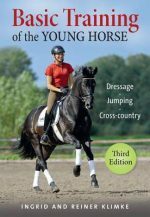 The training mastered in Book One will be necessary to accomplish the collected and extended gaits, pirouette at the canter, tempe flying changes of lead, piaffe and passage in Book Two.